Grana Padano is an Italian heritage product with a history that stretches back nearly 1,000 years. 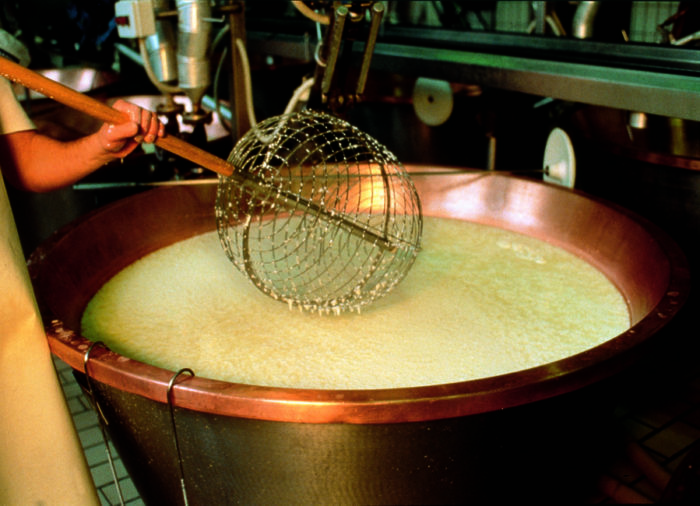 Today, the Consortium for the Protection of Grana Padano cheese ensures that the product remains top-class. We explore how the cheese is made, its fascinating origins, and some delicious recipes for you to try out! It is always satisfying to find a good use for the food scraps that accumulate while one is cooking. Carrot top pesto, anyone? Grana Padano, the world’s best-selling Protected Designation of Origin (PDO) cheese, was born out of that very same impulse. In 1135 BC, monks in the Po River Valley started preserving the extra milk that their cows produced each day. The result of this preservation process was a hard cheese, which the locals referred to as formaggio di grana, due to its grainy texture. 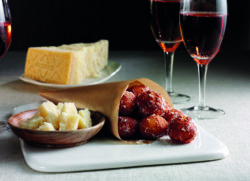 The cheese we still enjoy today got its name from the Po River, which in Latin is called Padus. Out of a few different types of formaggio di grana that originated in northern Italy, only two – Grana Padano and Parmigiano-Reggiano – were formally recognised by a European convention in 1951. In 1955, a presidential decree set out the recognitions of designations for Italian cheeses, and in 1957, the Consortium for the Protection of Grana Padano became the sole overseer of the cheese. This means that from 1957 onwards, everyone involved in the production and sale of the cheese has been supervised by the Consortium. As they employ about 40,000 people, and comprises over 4,500 farms, dairies, and maturing facilities, that is no mean feat! 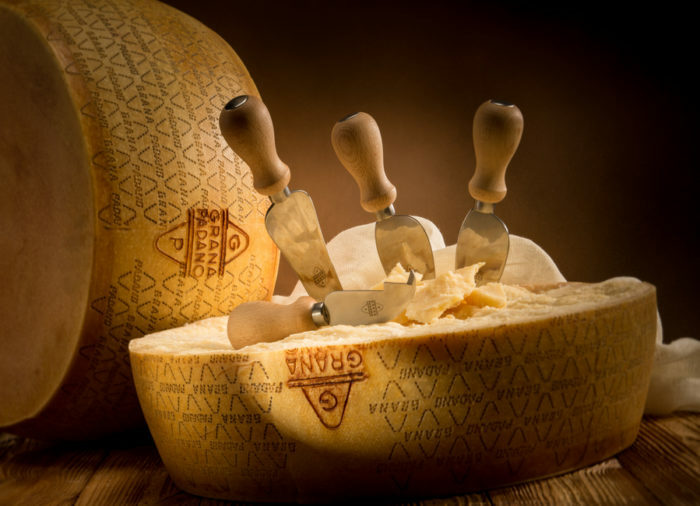 Grana Padano received Protected Designation of Origin (PDO) status in 1996. Like other PDO products, such as Champagne and Stilton (and more recently, Cornish pasties), it must adhere to a number of controls in order to earn its name. First of all, potential Grana Padano cheese must come from northern Italy, in an area that encompasses the Piedmont, Veneto, and Trento regions, along with a few parts of the Emilia-Romagna region. In the ninth month of the aging process – the point at which it becomes edible – producers check the cheese with a hammer, needle, and probe. 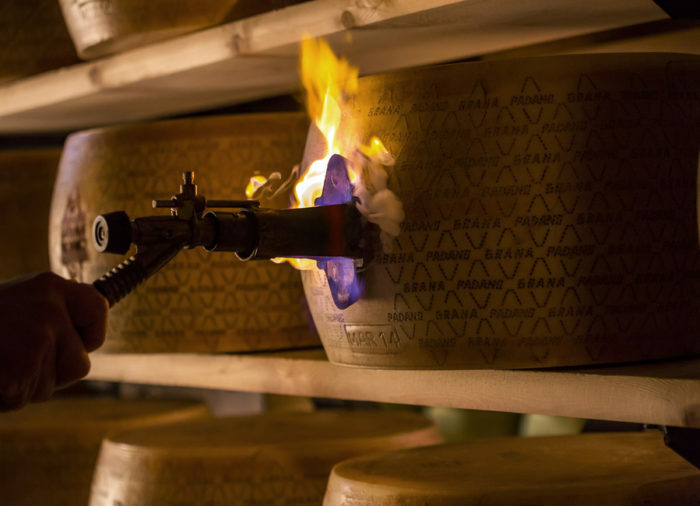 If a wheel of Grana Padano passes all the necessary tests, producers fire-brand it with the yellow mark. Merchants then sell it as Grana Padano PDO. However, it matures for up to 30 months, and if a wheel does not pass final inspections before packaging, its rind will undergo screening. This blocks out any marking that identifies the cheese. Next time you buy a wedge of hard cheese at the shop, see if you can spot the brand’s lozenge on the rind! This cheese is great for a balanced diet. It takes 15l of milk to produce 1kg, which means the final product is a concentrate of milk nutrients. It is also rich in calcium, with 50g containing over 600mg. 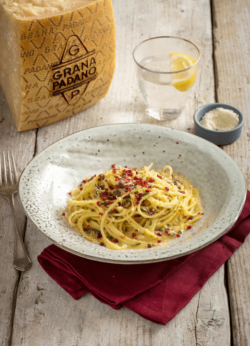 So from now on, if you’ve got Grana Padano in your fridge don’t forget to use it in more than just pasta sauce! The cheese can also be found in 3 grades of maturation. These are 9 – 16 months; aged over 16 months; and ‘Riserva’, which is aged over 20 months. The more it’s aged, the more it’s sought after by chefs and gourmets! Cook the spaghetti in a large pan of salted boiling water (for 100g of pasta you need 1l of water). In a separate pan, melt the butter, add three quarters of the lemon zest and the crushed pink peppercorns. When the pasta is almost cooked (and is al dente), use a pair of tongs (or drain the pasta but keep some of the water) and put the pasta in the pan with the lemon and pepper. Gradually add a little of the pasta water, (no more than 200 ml) and stir energetically. Take off the stove. Add the lemon juice, sprinkle the Grana Padano Riserva on top and garnish with remaining lemon zest and whole peppercorns. Cook’s tip: if wanted, a few slices of chopped smoked salmon are wonderful mixed into the spaghetti! Put the milk, butter and a pinch of salt into a pan. Heat over medium heat, stirring until melted and combined. Turn the heat to low, then add the flour and beat using a wooden spoon or a whisk until smooth. Next, add the Grana Padano and beat until the mixture comes away from the sides of the pan. Put the mixture into a bowl and mix in the eggs one at a time until the mixture is smooth. Season with pepper and nutmeg. Cover with oiled cling film and leave to cool completely. The mixture should be fairly sticky, like gnocchi. Put a good dusting of flour in a large bowl. Shape the dough using two teaspoons: one to scoop up a piece and the other to push it off the spoon into the bowl. Dust with flour, then shape into a small ball with your hands. Repeat with all the dough. In a heavy-based frying pan, heat some sunflower oil over medium heat. Fry the balls in batches, turning, for 6-8 minutes until golden. Add extra oil to the pan if necessary. Serve sprinkled with extra Grana Padano!